The idea is to: "...bring the king of fruits back! After being canned, mixed with all sorts of sugary liquids and blended into… some 80s dreadful cocktails, the pineapple needs more respect! Once a symbol of hospitality, the King of Fruits might be know misunderstood. One of the greatest non-citrus souring agents, used for crazy garnish ideas, infusions, old gum syrup flavoring, the pineapple is a fruit to be reckoned. Be in a tiki cocktails, an old school classic like the Algonquin, a crazy flavor pairing or just mixed in a delicious Verdita, get creative and make a cocktail using any part of this delicious, juicy fruit or share you favorite pineapple cocktail with us!" 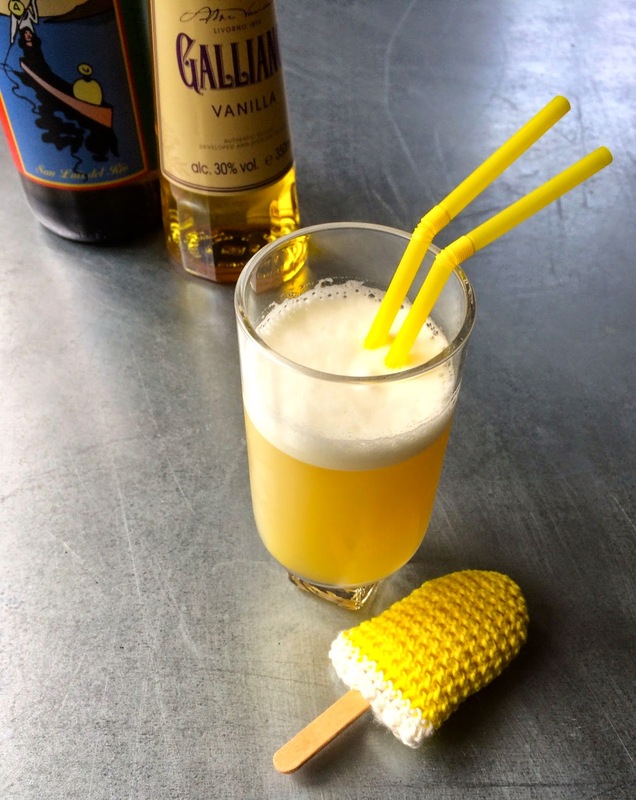 Since sometimes in the 50's the major ice cream company in Denmark have produced an ice cream lolly with a center of vanilla ice cream center and then a thin layer of pineapple sorbet on the outside. The wrapper is decorated with drawing from Copenhagen and Tivoli - the amusementpark in the city center all befitting the name Københavnerstang. There is nothing gourmet or New Nordic about it - it's most likely made from margarine, fake vanilla and artificial pineapple, but I've always liked it. In other to recreate it in a glass I had to decide on a base spirit. I do believe Danish bars since back in the 80'ies have made one with vodka and overly sweet pineapple juice. But that's not what I wanted. So I decided to go with Del Maguey's Crème de Mezcal, it has a little smoke from the mezcal and added sweetness, the vanilla I introduced by way of Galliano and then I mixed a little lemon juice into the pineapple juice to balance out all the sweetess. It workes well and would make a lovely summer dessert cocktail. Measure everything into a shaker, add ice and shake well. The pineapple juice will give you cocktail a lovely head of white foam.